iTunes does provide a solution to get your pictures from your PC to the iPhone but not vice versa. After a lot of searching the cheapest solution was to use Windows XPs Scanner and Cameras Tool. I opened it but the iPhone did not show up. After a lot of searching more I found the solution: You have to unlock your iPhone and then connect it to your PC. (I have a 1minute auto-lock with code → paranoid ugh?). Then you can find your iPhone in your Workspace and in the Scanners and Cameras applet. Go to Control-Panel and Open Scanners and Cameras. Choose the tab “Events” and select the option to save the picture to the folder of your choice. Every time you connect your iPhone (unlocked) your pictures should be synced from the iPhone to your PC one-way. PS: In Ubuntu this works also! Just connect your (unlocked, not jailbroken) iPhone to your Ubuntu-PC and use it like a normal camera. My current workstation is the left one (I will call it “workstation“) and I want to connect to the computer on the right (“server“). The workstation is running Windows XP, the server is running on Ubuntu Feisty. Setup Server(SSH+VNC): You have to install SSH and activate the VNC-Server, to be able to securely connect to your server. 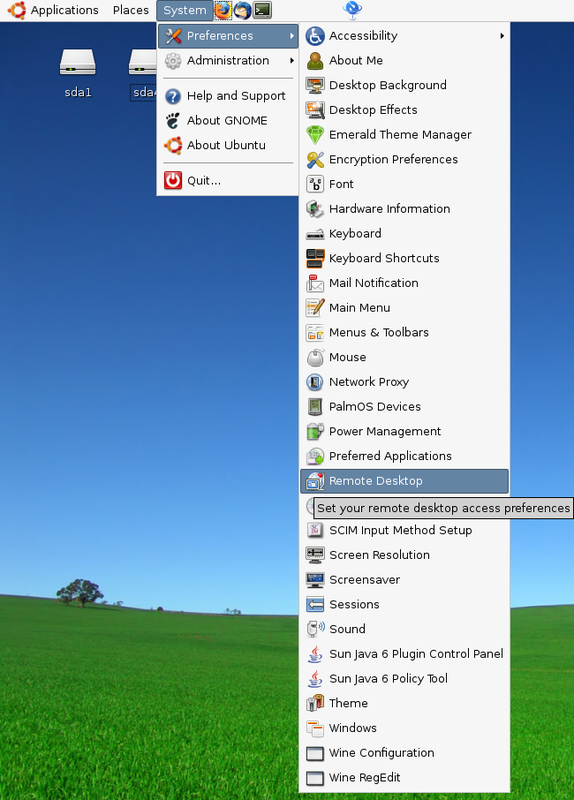 Enable VNC: VNC is already installed on yor Ubuntu system, so you only have to enable it. Navigate to System -> Preferences -> Remote Desktop. 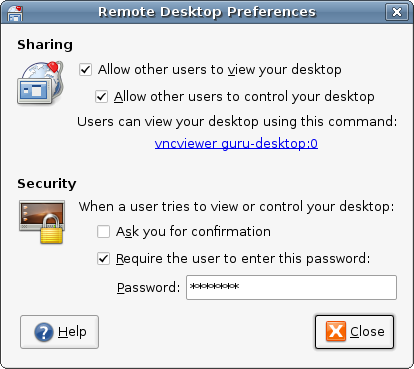 Now you should activate “Allow other users to view my desktop“, “Allow other users to control my desktop“, and for security purpose “Require the user to enter this password” and provide a secure password. Then click the Close-button. Now your VNC-server should be ready to use. Enter the hostname, you want to connect to on the first startpage “Session“. Here this is the router. You have to enter the external IP (in concreto: 80.80.205.145). If your “server” is directly connected to the internet you have to enter the external IP of your server. (This is the case if you have only a single PC and this PC is directly connected to the modem of your provider. Save your session and connect, so you can recall it later quickly by going back to “Session”. Type a meaningful name for your session below the “Saved Session” label and click “Save“. Now you can restore your session always by selecting it and click “Load“. Now you can click “Open” to connect to your server. Connect to your workstation: Now you will get a window where your username and password will be asked. Enter you login credentials to connect to your server and establish a SSH-tunnel. Download and install VNC. There are lots of free VNC apps for windows out there e.g. UltraVNC or TightVNC. Note that you only need the viewer. Start the vncviewer and connect to localhost (127.0.0.1) and enter your password which you provided in step 1.2.